Just out of interest, are you still convinced Brexit will happen? I detect a change in the air. My opinion has not changed since I first posted it here in July 2016. 1. We will leave the EU without a satisfactory agreement. 2. The resulting chaos will lead to Labour government. It's all a bit WW1 isn't it? Lions led by donkeys! Working on the basis that will not be an election (I cannot see enough Conservative MPs voting either for one or against any leader in a vote of no confidence to achieve the required 66% majority in the HoC to force one early under the Fixed Term Parliament Act), I note that not a single prospective replacement leader listed in The Times today is “running” on a Remain platform. “Boris Johnson has told allies to expect Theresa May to resign on Wednesday as leadership candidates scramble for position. Tory MPs yesterday reported “febrile” communications from those jockeying for position ahead of a contest many now expect imminently. Jeremy Hunt, the foreign secretary, is believed to be making a pitch as the candidate to deliver a “managed no-deal” exit. “He’s saying ‘you know what, no deal is not ideal but at the end of the day it would be fine,’ ” said a senior Tory on the right of the party. Sajid Javid, the home secretary, is making clear that he could not support a no-deal exit, saying that those who believe it would be an acceptable outcome are “deluded”. Both were absent from a meeting of supportive cabinet ministers called into Downing Street on Thursday to discuss the vote. The hard Brexit wing of the Tory party, led by Jacob Rees-Mogg, is determined to field a single candidate but cannot agree between Mr Johnson and Dominic Raab. The prime minister has held meetings and conference calls with activists and launched leaflet campaigns to convince the party to back her Brexit deal. A survey of 1,262 Tory members, taken on Thursday and yesterday, suggests that 72 per cent reject her deal and want their MP to do the same. Twenty-six per cent want their MP to accept the deal and 2 per cent are unsure. Last edited by ORAC; 8th Dec 2018 at 07:23. People keep saying I need to get more concessions from EU leaders. So I called Emmanuel Macron this morning and I told him that I didn’t think they all appreciated the pressure I was under. I must say the willingness of your average French to get all uppity at the drop of a beret & start burning tyres on the Champs Elysées is heart warming. I sometimes wish we did it a bit more often, keep the buggers honest. vive la Gilly Joan. Sort of know what you mean but this (the French thing) has gone on a bit now.. The government has already done a U turn on the Diesel tax issue that p******d a lot of rural dwellers off and started all this, so that’s a plus for direct action ...but it has now been highjacked by various f wits, from both the left and right wing, or even not politically aligned, just trouble makers..
Last edited by wiggy; 8th Dec 2018 at 07:09. Yes, I should have qualified that. I think we'd all stop short of people dying in the protests & clapping the bunch who want to smash things up just for the fun of it. I believe here they're known as the ERG. This point was covered in the Grauniad recently. It references the 1979 devolution referendum in Scotland. In that particular case a late ammendment to introduce a 40% threshold made all the difference. In the 2016 model however, it is not so much the narrowness of the margin which made the difference, but reported financial irregularities behind the leave campaign. On that basis the EU referendum result is unsafe and should be declared void. They overspent by a small amount and did so whilst acting on the advice of the overwhelmingly pro remain led Electoral Commission. Total leave spend was significantly less than remain and leave didn't benefit from the £9m government pro remain leaflet. Remain also benefited from the status quo effect and benefited from the sick animals who used Jo Cox's slaughter to encourage anti brexit and anti brexiteer sentiment. Remain also had the BBC, literally every entertainer in the UK, social media bias, the EU themselves and Obama working in their favour. Remain still lost by well over a million votes but we are to believe it was because of an estimated 4% overspend by the leave campaign? Last edited by CroqueMonsieur; 8th Dec 2018 at 07:40. The leave spend is an absolute crime scene, any other conclusion is frankly so tone deaf it makes Justin Bieber seem like Pavarotti. And who did that exactly? No one I can recall. What I do remember is Nige stoking the fires with his Nazi themed billboard the day of Jo Cox's murder, dire warnings of millions of Turks coming in due to the 'imminent' accession of Turkey, which of course was another big fat lie & Africans massing at the doors of the NHS for HIV treatment, if we're doing capitalising on dog whistle themes. Not true in respect to the BBC. The conduct of Robinson and Neal across social media is matched by Humphrys, Dimbleby and Marr using their publicly funded platforms on a host broadcast service to shout down pro-EU opinion. Another institution that is no longer trustworthy was also out on maneouvres this week. With debate over Northern Ireland serving as a useful distraction, the Conservative party released on the UK government website details of how they expect to save £1billion for the NHS in 2019. In effect, their plan to disguise possible disruption to the NHS drugs supply chain is to give pharmacists the power to alter GP prescriptions. It wasn't easy wrestling the title ' worst health secretary in living memory' from his predecessor, but this week Hancock not only accomplished that task, but managed to violate the ministerial code by using his social media account to promote a private company. Just another day in the office for a minister in the May cabinet. What a time to be alive .. unless you happen to be a self funded private patient, trying to absorb a 503% increase on the cost of your drugs since November 2017. If that reality had been painted on the side of a red bus two years ago, people wouldn't be in this current position, arguing the toss over the validity of campaign promises which clearly cannot be delivered. It was all over social media at the time. Remember we are told that a few dollars of spend by the Russians were to blame for brexit so we must therefore accept that social media is exceptionally powerful. Genuine and reasoned debate was shut down online and am evil sentiment was created. That one being if you’re pro leave you’re no different from the toxic hate that killed Jo Cox. 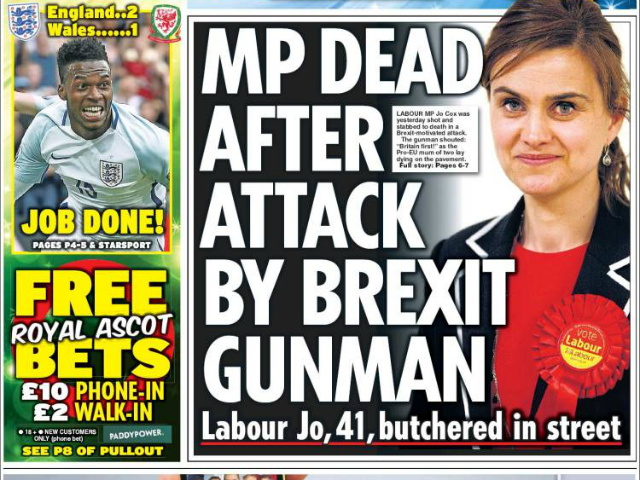 Hariett Harman also quite rightly did that we should unite against the hate that killed Jo. Absolutely right. However the fact that she chose to do that at a pro remain rally was pretty low. Last edited by CroqueMonsieur; 8th Dec 2018 at 11:08. Really? Neil is more Leave than remain but gives everyone a grilling. I’m talking about the organisation as a whole. It’s an organisation that is meant to be impartial but is far from it. Take a look at the Mash Report and tell me they aren’t biased! I’ll give them credit though that they have changed over the last six months or so and at least try and provide balance on the news when discussing the issue but their news is always slanted toward the negative. At the time they were far from it. Neil has a few shows a week. BBC news was 24/7. The rest of your rest of your post is irrelevant whataboutery. We are talking about the lead up to the vote. The establishment and its media thought they could all just brand brexiteers racist and push their little project fear and that all will be successful and the question would be put to bed. They had their chance and they blew it. Perhaps if more was made about the benefits of the EU we would be in a different situation. Alas, leave won. Negative campaigning is rarely successful. Remain, Hilary, Tories in GE17 all show us that. Last edited by CroqueMonsieur; 8th Dec 2018 at 11:19. You could also add narcissistic personality disorder, something which appears rather common in politicians. ...The rest of your rest of your post is irrelevant whataboutery. We are talking about the lead up to the vote..
And I talking about how systemic bias at the BBC not only shaped the quality of debate before and after the referendum, but continues to shape the pro-government news cycle in the critical year ahead. This influence is far from irrelavant, and neither are the effects on everday life of a Tory government in a state of total collapse. It's been a pleasure chatting with you CroqueMonsieur, but if you'll excuse me, I have an urgent appointment with reality. And I talking about how bias at the BBC not only shaped the quality of debate before and after the referendum, but continues to shape the pro-government news cycle in the critical year ahead. Indeed. If someone doesn’t suit your anti brexit, anti Tory agenda just insult them and ignore them. It’s much easier that way. On the other hand the chief executive of UK major ports group, who ought to know a lot about shifting stuff around says that planning restrictions are more of a challenge to UK ports than the supposed logjam. How is privatisation working for you? East Coast main line is a failure with Mr Beardy no doubt trousering a decent wedge. Carillion was just stupid beyond belief. Now we have Interserve, crying about thei £500M debt! And which donley thought it a good idea to give contracts to the same company for such closely related matters as 'Improving J6 on the M5!, cleaning all Network Rail's main line stations, providing security at hospitals and providing probation services, monitoring 40,000 offenders for the MoJ'! A refrain of "Here we go again" might be in order here. I bet it was the same before privatisation except the taxpayer picked up the bill. SIR – The impact of Brexit at Dover would not be common to the UK ports sector as a whole. I write on behalf of the United Kingdom’s major port operators, responsible for handling 75 per cent of the country’s seaborne trade. Dover, handling around 6 per cent of UK port volumes, faces a unique combination of Brexit risk factors that are not faced by most major UK ports. These ports already have the capacity and infrastructure to handle large volumes of both EU and non-EU trade today without “logjam”. The UK’s port sector is resilient, adaptable and highly competitive. We will work through the challenges of Brexit as we have with huge changes through the centuries. Our island nation has always been dependent on sea trade and the ports that enable it. UK Major Ports Group members invest more than half a billion pounds of private-sector funds a year in the UK. They are ambitious to do more, whatever the eventual Brexit outcome. Making the planning system for ports more helpful to investment is key to unlocking their potential.